Apple Raisin Irish Oatmeal warmed me up after a quick bike ride this morning. Lunch was leftovers from last night, and homemade applesauce as a snack. 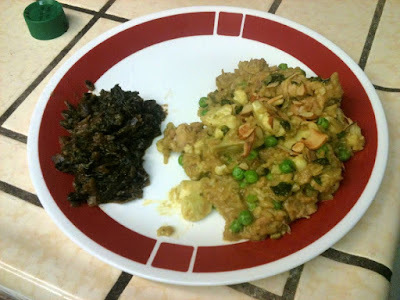 Dinner was a one-pot slow cooker meal that I love--Curried Chicken and Rice. Since I had the greens left from the beets I looked up an indian-inspired recipe and came up with Braised Beet Greens, which added a little more greenery to our meal. Heat 2 Tbsp. of the oil in a skillet over medium-high heat until shimmering. Add onions, jalapeno, garlic, ginger, curry, and garam masala and cook until vegetables are soft and lightly browned, 8-10 min. Stir in flour and cook for 1 min. Slowly whisk incoconut milk, scraping up any browned bits and smoothing out lumps, then transfer to slow cooker. Season chicken with salt and pepper, add to slow cooker, and coat evenly with sauce. Cover and cook until chicken is tender, 4-6 hours on low. Break up chicken into bite-size pieces with wooden spoon. Stir in rice and 1 tsp. salt, cover, and cook on high until rice is tender, 20-30 min. Microwave cauliflower with remaining 1 Tbsp. oil in a large bowl, stirring occasionally, until tender, about 4 min. Stir softened cauliflower and peas into slow cooker and let sit until heated through, about 5 min. Sprinkle with almonds and cilantro and serve.